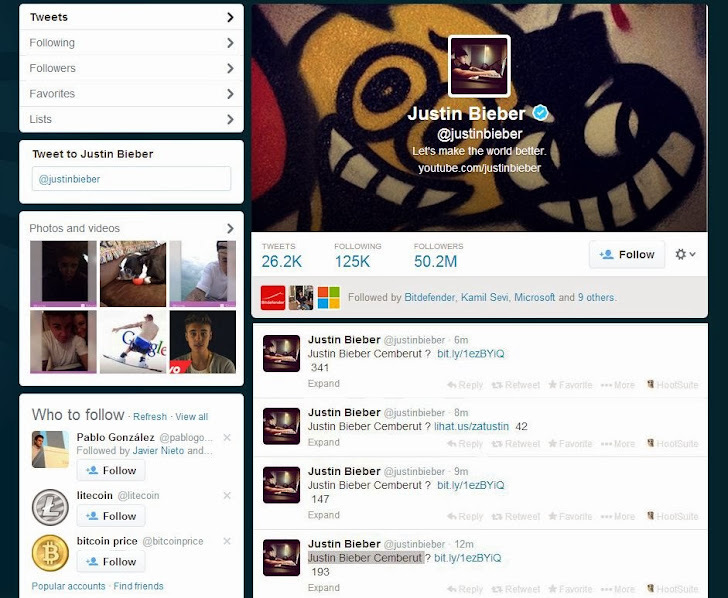 Pop Singer Justin Bieber's Twitter account hacked for around 15 minutes before it was corrected! The Twitter account with 50.2 Million Followers was compromised i.e. Twitter account with the second most Twitter followers. Spammers tweeted in Indonesian language from his hacked account with the links to a malicious twitter app named "ShootingStarPro", and messages reading “Justin Bieber Cemberut?”, means - "Justin Bieber sullen?" It seems that the Justin's twitter account was hijacked by Indonesian hacker with a malicious twitter app, that further tweeted links to the a malicious website rumahfollowers[dot]tk that hosted "ShootingStarPro" app, aimed to target his millions of followers in one shot. Justin's team quickly responded to the issue, deleted the bogus tweets and told fans "All good now. We handled it.". He also warned his followers, "That link from earlier. Don’t click it. Virus. Going to erase this now. Spread the word. Thanks." Probably thousands of followers might have clicked on those links. If you have also clicked such link or authorized a malicious application for your twitter account, then you should change your password immediately. As always, we recommend selecting a strong password that is unique to each website. Review the applications you have been granted access to your Twitter account and revoke access to all suspicious apps to make sure the scammers can’t abuse your account. After this incident, "#JustinsPasswordIsProbably" hash tag is trending throughout the globe.